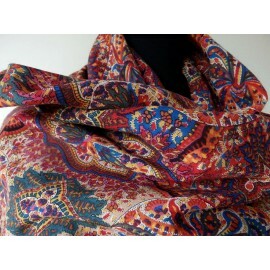 > Scarves with a Past.>Liberty of London. Arthur Liberty (1843-1917) 1875 Arthur Liberty opened the shop on Regent St, London. 1890 a branch of Liberty's was opened in Paris, but closed in 1932. 1925 a new store was opened in Great Marlborough Street, Liberty began to produce small floral prints, known as Liberty prints. Tana Lawn is still there best seller. 1932 in an efford to upgrade, they employed Paul Poiret to design for them. Liberty commissioned some of the top designers, Jacqueline Groag, Lucienne Day, Robert Steward and more. In the early 1950's Colleen Farr textile designer and educator, launched the fabric design studio at Liberty & Co. which is still in existence today. 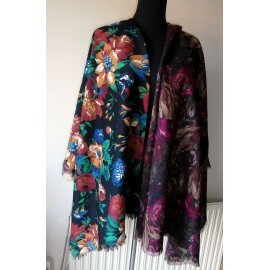 She also worked with Martin Batersby in 1961 on the Liberty collection. Liberty's attracted customers like Yves Saint Laurent, Jean Muir and more. Collier Campbell sisters did a lot of designs for Liberty. Liberty of London. There are 52 products. 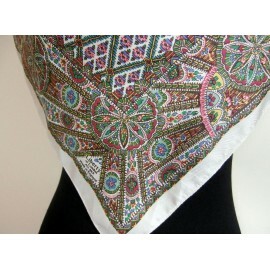 Liberty of London pretty confetti candy colored vintage silk scarf. 100% silk with machined hems. 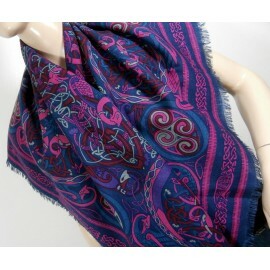 Liberty of London name printed on scarf. 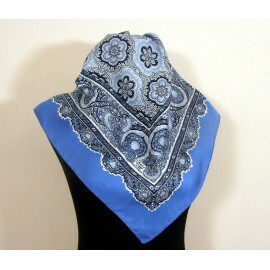 This comes in in excellent condition, colors are vibrant and bright, no holes, no pulled threads and no stains. 27 inches 26.5 inches. 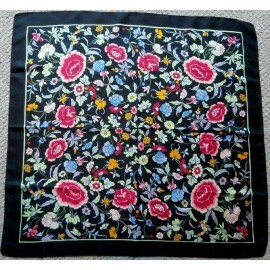 Liberty of London beautiful floral detailed vintage silk scarf, unused. This is unused and comes with Liberty carrier bag, so it would make a nice gift. So much detailing in the design. 100% silk twill with very plump hand rolled hems. Liberty name printed on scarf. Silk is crisp and vibrant. This is unused, excellent condition. 27.5 inches square. 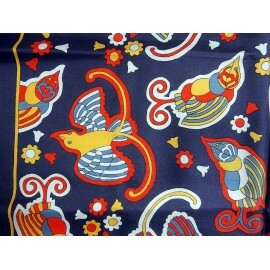 Liberty of London Art Deco Inspired Vibrant Vintage Long Silk Scarf. 100% silk with machined edges. 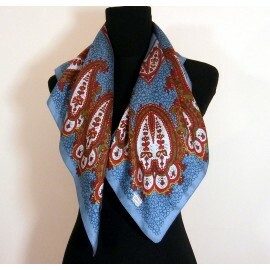 Liberty of London name logo printed on scarf. Comes in good condition. 52 inches x 11.5 inches. 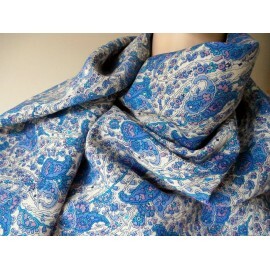 Liberty of London striking, bold and unusual vintage silk scarf. 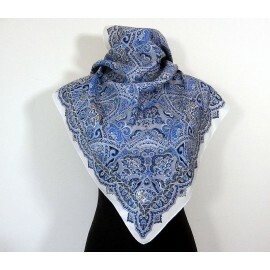 100% silk with machined hems, Liberty logo printed on scarf. Comes in good condition. 28 inches x 27 inches. 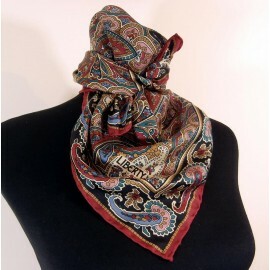 Liberty of London rich fiery tones, silk vintage scarf. 100% silk twill with plump hand rolled hems. Liberty name printed on scarf. Looks and feels unused. 27.5 inches x 27 inches. 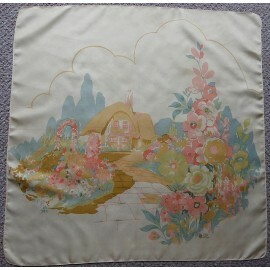 Liberty of London English country garden vintage silk scarf. 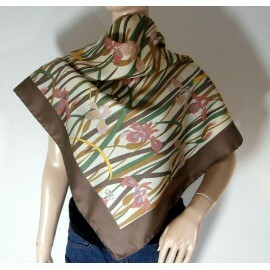 100% silk, Liberty name printed on scarf. Lovely subtle colours. Comes in good condition. 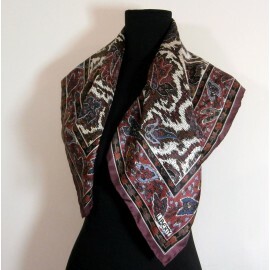 23.5" x 22.5"
Liberty of London beautiful vintage silk scarf.100% silk, Liberty name printed on scarf.Comes in excellent condition, the silk still feels crisp and the colours are not washed out. 23.5 inches square. 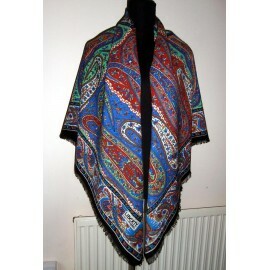 Liberty of London varuna wool shawl, it looks unused. Beautiful colours azure blue, emerald, turquoise and lots more. 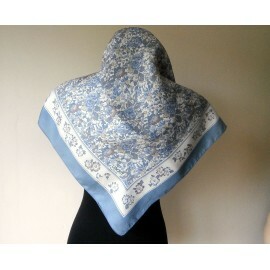 The Liberty design name for this is called 'Darlington' Liberty name printed on shawl. Looks unused, the fringe is excellent. 53" x 50" (inches).... not including the fringe. 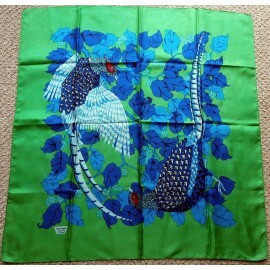 Liberty of London vintage silk scarf, paisley with butterflies in the border. Colours are pistachio, rose pink, wisteria blue as well as others. 100% silk with very plump hand rolled hems. Liberty name/ logo printed on scarf. This is vintage but looks unused. 27 inches square. 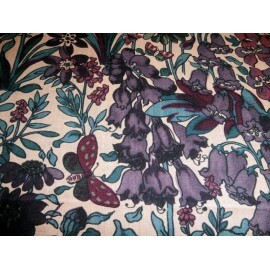 Liberty of London William Morris - Arts & Crafts inspired vintage silk scarf. 100% Silk with rolled hems. Azure blue border with raspberry, candyfloss pink, denim blue, turquoise green, lemon and more. Comes in very good condition. As stated above looks unused. 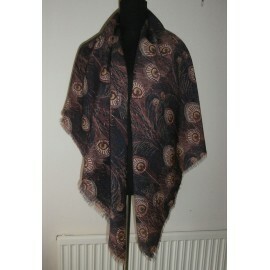 27" x27"
Liberty of London rare peacock feather and honesty vintage silk scarf, really is beautiful. 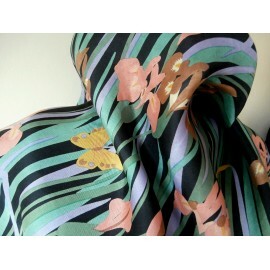 100% silk chiffon with very plump hand rolled hems. The silk ciffon can be ironed flat, or can be left crinkled. Liberty of London name printed on the scarf. 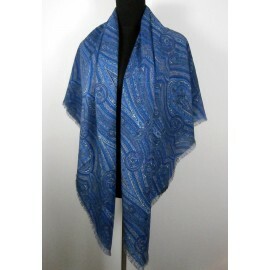 This comes in excellent condition 31" x 29.5"
Liberty of London peacock feather or correct design name Hera, vintage varuna wool shawl. 100% varuna wool, usual fringed edge. As you will see I do have another listed called ' Dog and Dragon' Condition This looks unused... BUT this has some moth damage it can still be worn, due to the busyness of the design and colors, this has been treated. 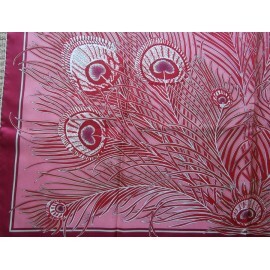 Size 52" x 52"
Liberty Pretty Art Deco Inspired Vintage Silk Scarf. 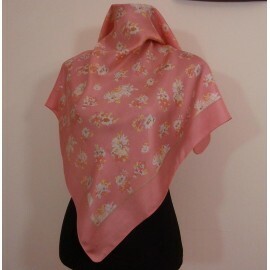 100% silk with machined hem, Liberty name printed on scarf. 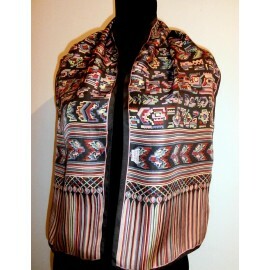 Comes in very good condition, not dure if it has ever been worn. 27.5" x 27"
Liberty of London rare unusual 1950's mobile design vintage silk scarf. Would look good framed. 100% silk with machined hem. Liberty name printed on scarf. Comes in good condition except for a tiny faint mark. 23" square. 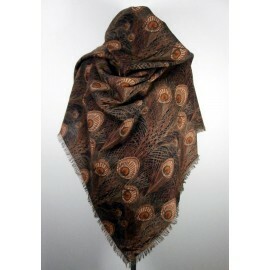 Liberty of London vintage varuna wool shawl. 100% varuna wool, usual fringe edge. This looks unused... BUT this has moth damage. It can still be worn when folded over to wear, it has been treated. 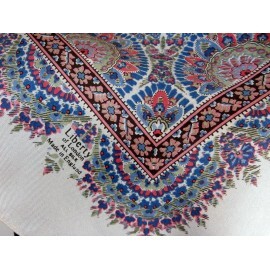 52" x 52"
Liberty of London rare silk double sided pretty ditsy vintage scarf. 100% silk both sides. Liberty label attached. Comes in very good condition. 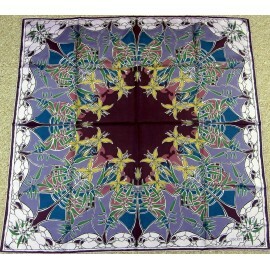 44" x 11"
Liberty of London really pretty vintage silk scarf. 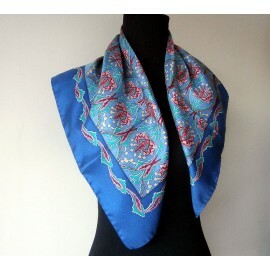 I will be listing more vintage Liberty scarves. Colours really are pretty and much better in real life, salmon pink, duck egg blue, sherbet lemon, looks like old fashioned lilac. 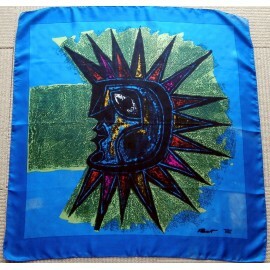 100% silk, Liberty name printed on scarf. The silk is very vibrant not washed out. Comes in good vintage condition. 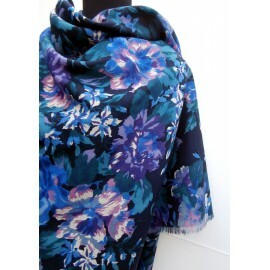 27.5" x 27"
Liberty of London Fantastic Jewel Colours Varuna Wool Vintage Shawl. Looks and feels unused. 100% varuna wool, usual fringing all around the edge. 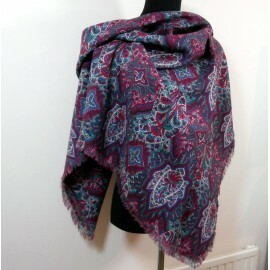 Liberty of London name printed on scarf. Comes in excellent condition, which to me looks unused. 52 inches square. 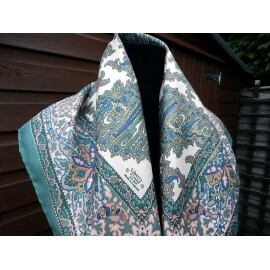 Liberty of London vintage silk scarf. 100% silk twill with very plump hand rolled hems. 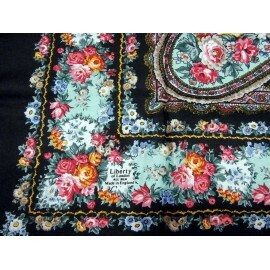 Liberty name printed on scarf Comes in excellent condition. 27"inches square. 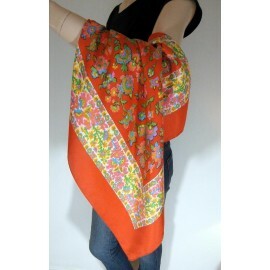 Liberty of London Smart and Unusual Vintage Silk Chiffon Scarf. 100% silk chiffon, so light in weight but still has that substance. Liberty name printed on scarf. Comes in very good condition, very good. 64" x 15" but does stretch out more. 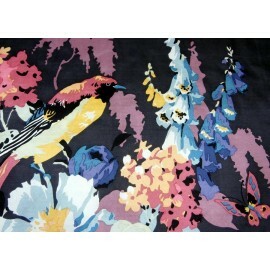 Liberty of London Amazing Bird Butterfly and Exploding Blooms Vintage Silk Scarf. 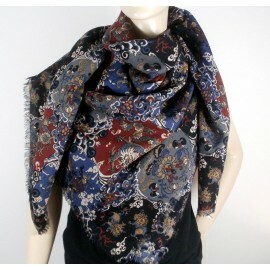 100% silk with machined hem, Liberty name printed on scarf. I have to say beautiful colours which are still vibrant. This comes in very good condition, the only thing to mention it has a very faint small mark on border if you can find it. 27.5" square. 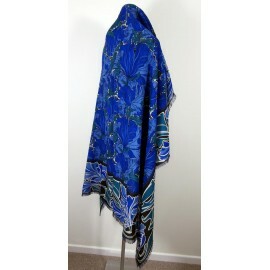 Liberty of London Large Varuna Wool Vintage Shawl. Design name is called "Samarkand" In 1996 this fabric alone cost £23 per meter. This is in lovely shades of different blues. 100% wool, fringed edge all around. Liberty label attached on reverse. This comes in very good condition, it looks unused. 52 inches x 50 inches. 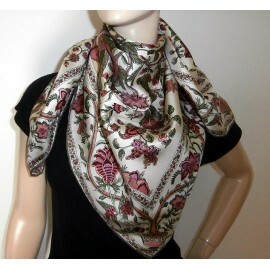 Liberty of London Beautiful Botanical Print, Mixed with Paisley Vintage Silk Scarf. I have to say this is a wonderful design. This has the most beautiful colours from duck egg blue to every colour you can think of. 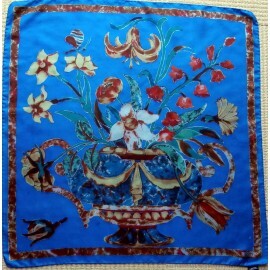 100% silk and the Liberty of London name printed on the silk. Comes in excellent condition. 27.5 inches x 26.5 inches. 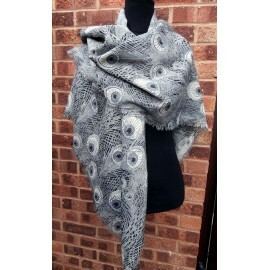 Liberty of London Peacock Feather, or Hera Varuna Wool Shawl... Looks Unused. Rich sumptuous colours. 100% varuna wool, with fringed edge all around. Liberty label attached on reverse. Excellent condition, looks unused. 52 inches square. 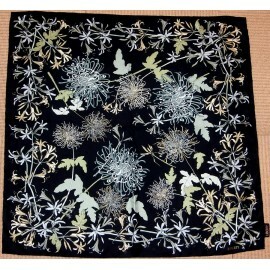 Liberty of London Tree of Life Large Vintage Silk Scarf. I always think this design is so Luxurious. 100% silk twill with hand rolled hem. 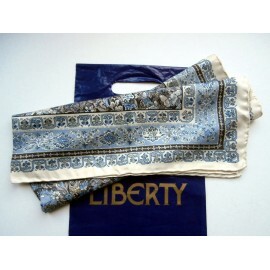 Liberty name printed on scarf This comes in good condition. 35 inches x 34.5 inches. 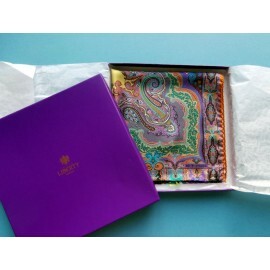 Liberty of London Beautiful Large Silk Scarf. 100% silk twill, hand rolled hem. Liberty name printed on scarf, also name and care tag attached. Unused.... excellent. 34.5 inches square. 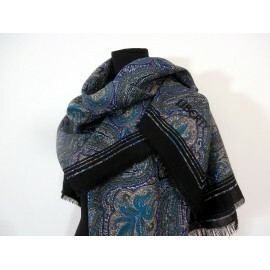 Liberty of London Varuna Wool Large Celtic Design, Vintage Shawl. Beautiful Colourway, pink, purple, claret, grey, denim blue and more. 100% Varuna wool, with the usual fringed edge. Liberty label attached on reverse. Comes in good condition. 52 inches x 47 inches. 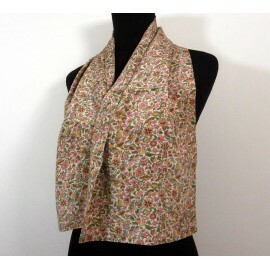 Liberty of London Satsuma Chintz Delicious Vintage Silk Scarf﻿. Amazing colours, orange, turquoise, buttercup yellow, apple green, ivory and bubblegum pink. 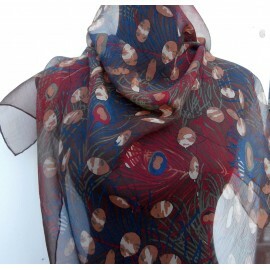 100% silk with machined hem, Liberty name printed on scarf. This comes in very good condition. 27.5"inches square. 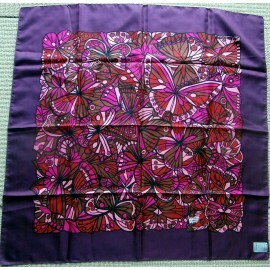 Liberty of London Irises & Butterflies Large Vintage Silk Scarf. 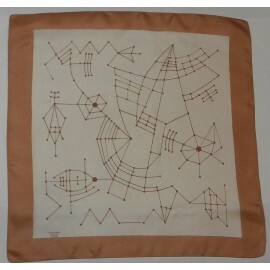 The artwork for this scarf was originally designed by Collier Campbell in 1975. Inspired by a traditional japanese embroidered kimono. 100% Silk with hand rolled hem. Liberty name printed on scarf. 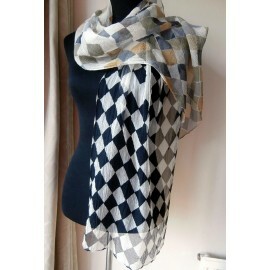 This scarf comes in very good condition. 34.5"inches x 32.5"inches. 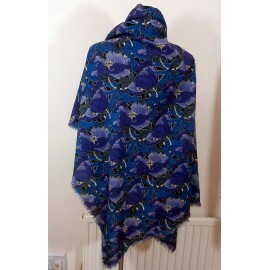 Liberty of London RARE Colour Hera, Peacock Feather, Large Varuna Vintage Wool Shawl. This is unused and comes in Monochrome and shades of grey. Would make a lovely gift. 100% wool with the usual fringe all around. Liberty label attached on reverse. Unused... Excellent. 52"inches square. 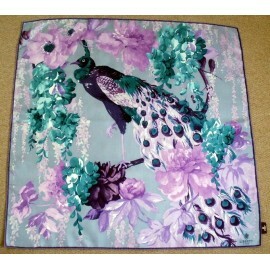 Liberty of London Fantastic Peacock Bird Large Silk Scarf........ amazing colors. These sold for £135 in Liberty of London. 100% quality weight silk twill, hand rolled hem. Liberty name printed on scarf also liberty name label attached. This is pre-owned but comes in excellent condition. 34.5"inches x 34"inches.